In today's digital arena, Mobile application is the best way to reach the target audience. Technology is constantly transforming to offer the most suited solutions based on the trend. There are various online development platforms are available for developing the desired mobile application, and these platforms are simple and do not seek any prior experience or coding knowledge. There are various software and Mobile App Development companies, however, deciding the worthiness of the each is difficult. 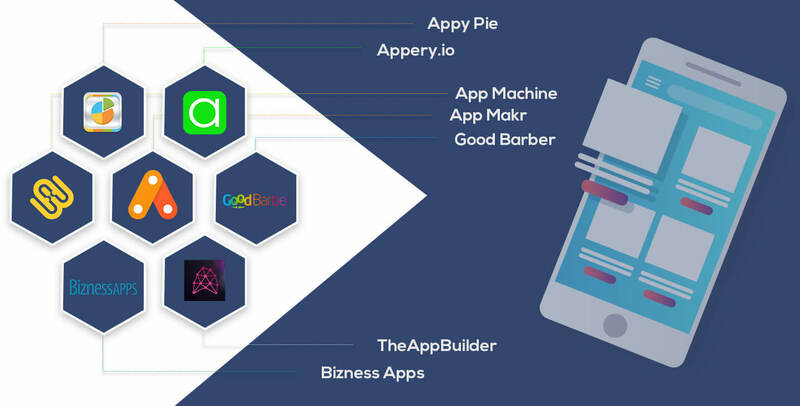 In this blog, we have made an attempt to provide a complete list of efficient tools that enables the cross-platform mobile application development. This cloud-based mobile-app builder helps to develop a mobile application for both Android and iOS operating System. No need to download or install anything to use this application as it can be directly used for executing work on the cloud. With the built-in components - there is also access to PhoneGap, Ionic, jQuery Mobile. Using this tool - allows building the UI with a visual editor having drag and drop components. A code is generated by Appery for the components to drop in. The app development is simple, easy and fast. You can use the Appery plugin catalog to enhance the functionality of the app and use the customized private plugin. Available at an affordable price - this van used for both the personal and team usage. Appy Pie is best used by developers to build an application for any operating system or device. This cloud-based mobile app tool offers easy development without much use of programming language. This platform is efficiency can be evaluated as all the updates and work execution has a real-time response. Further, no need to put extra effort to create personalized mobile applications simply drags and drop will be enough. Furthermore, it offers the opportunity to integrate apps with social media, videos, audio, blogs and other. Available for Free with ads, However, for the ad-free version you need to go with the platinum purchase. In case you are looking to design professional applications native to both iOS and Android, the App Machine offers easy designing with drag and drop option. This further provides an option to go for customization and connect it with different social media platforms. It is one of the efficient tools to develop as many numbers of applications for Android, iOS, and HTML. This tool enables to add unlimited updates and features to the development that includes chat room, photo gallery, In-app shopping, Google Maps, In-app shopping, and others. The tools can be availed at a monthly plan, however, not charged for per-app basis. For small businesses - Bizness apps offer an efficient Mobile application development solution. This enables application development in a short time period using the built-in tools. Further, it offers application personalization and other features like ordering, adding a shopping cart, mail, message, and push notification. Thus developers can easily make updates as well as modify the apps online. Apart from the designing platform - it provides a long list of the tutorial to design the app. When you want the option for both the application and web development - Good Barber comes as a great choice. The developers can build custom features and outlook for the application without having to write any code for it. The changes taking place in the apps function is real time. you can. Further, the adjustment of any para enters provide immediate visual Feedback. This is an awesome platform and guides hows to work on this respective platform to create the required application depending upon the business type. Along with development assistance, it allows to update and make changes in the structure, after going live. Cross-platform Mobile application development is highly in demand as it offers easy deployment for both the iOS and Android platform and no separate coding is required. Are you also looking for a Cross-Platform Mobile App, fill in the form given below with your complete requirement. We are happy to cater our client’s unique requirement!